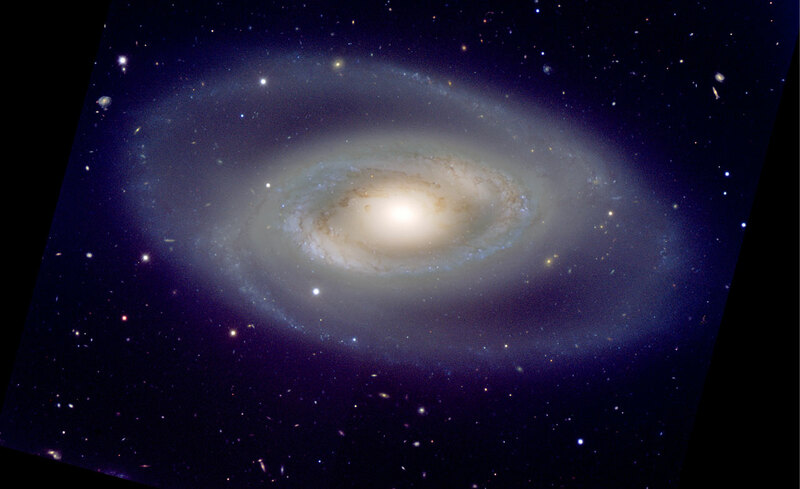 Astronomers have released a new, stunning picture of the spiral galaxy NGC 1350. Resembling the shape of an eye, the galaxy exhibits a double ring structure whose blue glow reveals the presence of many young stars. Eighty-five million years ago, in another corner of the Universe, light left the beautiful spiral galaxy NGC 1350, for a journey across the universe. Part of this light was recorded at the beginning of the year 2000 AD by ESO's Very Large Telescope, located on the 2,600m high Cerro Paranal in the Chilean Andes on planet Earth. The rather faint and graceful outer arms originate at the inner main ring and can be traced for almost half a circle when they each meet the opposite arm, giving the impression of completing a second outer ring, the "eye". The arms are given a blue tint as a result of the presence of very young and massive stars. The amount of dust, seen as small fragmented dust spirals in the central part of the galaxy and producing a fine tapestry that bear resemblance with blood vessels in the eye, is also a signature of the formation of stars. The outer parts of the galaxy are so tenuous that many background galaxies can be seen shining through them, providing the observers with an awesome sense of depth. It is indeed quite remarkable to see that with a total exposure time of only 16 minutes, the VLT lets us admire such an incredible collection of island universes wandering about in the sky. The image is a mosaic of some of the most prominent galaxies found in the images. Some of these may reside as far as several billion light-years away, i.e. the light from these galaxies was emitted when the Sun and the Earth had not yet formed. The Sun rotates around the centre of the Milky Way and completes a full circle in about 200 million years. Fornax (The Furnace) was named by French astronomer Nicolas Louis de La Caille (1713-1762), when observing from the Cape between 1750 and 1754. He defined 14 new southern constellations, giving them the names of scientific instruments - e.g. the Telescope - or names taken from the fine arts - e.g. the Sculptor. The original name he proposed was Fornax Chemica (Latin for chemical furnace) as a tribute to famous chemist Antoine Lavoisier (1743-1794). This means that, 85 million years ago, when the light we now record left it, the galaxy was 530,000 light-years closer to us. eso0532a is a colour-composite image based on data collected with the FORS2 instrument on the VLT on January 26, 2000, at a time when Kueyen was still in its commissioning phase. The observations were done in four different filters (B - exposure time: 6 min, V - 4 min, R - 3 min, and I - 3 min), each associated with a given colour (blue, green, orange and red, respectively). The image covers a region of 8x5 arcmin2 on the sky. North is to the left and East is down. The images were extracted from the ESO science data archive and further processed by Henri Boffin (ESO) and the colour composite was made by Haennes Heyer and Ed Janssen (ESO). An image, reproduced from the "Exploring the Southern Sky" book by S. Laustsen, C. Madsen and R.M. West, showing the Fornax Cluster of Galaxies and the position of several prominent members is available on the Fornax Cluster page.